The welfare state is bad news. It’s bad for taxpayers and it’s bad for recipients. It’s also bad for the economy since prosperity is in part a function of the quantity of labor that is productively employed. As such, government programs that lure people into dependency obviously reduce national economic output. We can get a sense of how the nation is being hurt by reviewing some of the scholarly literature. Writing for the Cato Journal, Lowell Gallaway and Daniel Garrett explore the relationship between redistribution spending and poverty reduction. They start by pointing out that more welfare spending used to be associated with reductions in poverty. But when President Johnson launched his so-called War on Poverty and dramatically increased the level of redistribution, the link between welfare spending and poverty reduction substantially weakened. …the real per capita cost in the United States of federal public aid rose 70 percent in the 11 years between 1953—the first year the federal government reported an official poverty rate—and Johnson’s 1964 remarks. In the 11 years that followed, however, that same real per capita cost increased by an astonishing 434 percent—that is, more than six times faster than in 1953–64. …in 1953–64, every 10 percentage point increase in public aid was associated with a 1 percentage point drop in the official poverty rate. Compare that with the experience of the 11 years following the outbreak of hostilities in the War on Poverty. During that interval, every 1 percentage point fall in the poverty rate was accompanied by a 50 percentage point increase in real public aid. …the relationship between public aid and the poverty rate is subject to the principle of diminishing returns. Not just a diminishing return. There’s a point at which more redistribution actually leads to an increase in poverty. Just like there’s a point at which higher tax rates lead to less revenue. And the authors recognize this link. 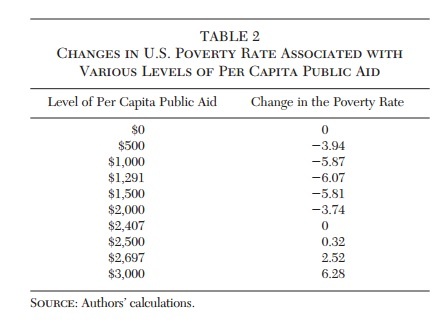 This is a Laffer Curve type relationship, which is to say that while public aid initially decreases poverty, there eventually comes a point at which additional increases in public aid increase poverty. …the effectiveness of additional real public aid expenditures, as a policy instrument designed to reduce the poverty rate, had been exhausted by the mid-1970s. Indeed, any additional public aid beyond the mid-1970s levels would result in an increase, not a decrease, in the poverty rate. Gallaway and Garrett crunch the numbers. …to calculate the impact of public aid expenditures on the incidence of poverty in the United States. The greatest poverty-reducing effect occurs at $1,291 of per capita expenditures on public aid, which produces a 6.07 percentage point reduction in the overall poverty rate. However, as the level of real per capita public aid rises beyond $1,291, the poverty reducing effect is eroded. …at $2,407 of per capita public aid, all of the initial reductions in the poverty rate have disappeared. …By 2010, real per capita aid stood at $2,697—a level that produces a 2.52 percentage point increase in the poverty rate. Thus, the impact of per capita public aid in 2010 being $1,406 greater than the optimal, poverty-reducing level was to increase the poverty rate by 8.59 percentage points, according to our analysis. Here’s the relevant table from their article. Unfortunately, they didn’t create a hypothetical curve to show these numbers, so we don’t have the welfare/poverty version of the Laffer Curve. But they do estimate the negative human impact of excessive redistribution spending. Since the official poverty rate in 2010 was 15.1 percent, this implies that in the absence of that extra $1,406 of per capita public aid, the official poverty rate in 2010 would have been 6.5 percent. …Taking dynamic factors into consideration would probably lower the figure to less than 6 percent. This implies that the actual poverty rate in 2010 was more than two and-one-half times higher than it could have been were it not for the excessive use of public aid income transfers as an instrument of policy. In other words, it may be argued that public aid overreach was responsible for approximately 30 million extra people living in poverty in 2010. And children are among the biggest victims. …one in every eight American children is living below the poverty line because public aid payments exceed the level that would minimize the poverty rate. Ugh, this is terrible news. Children raised in government-dependent households are significantly more likely to suffer adverse life outcomes, in large part because of very poor social capital. Last but not least, the authors also speculate that excessive redistribution may be one of the reasons why the distribution of income has shifted. …up to the mid- 1970s, government cash income transfers (public aid) were increasing the incomes of those in the bottom quintile of the income distribution by more than work-disincentive effects were reducing them. The result was a reduction in the official poverty rate. …However, as the volume of public aid payments continued to increase, the work-disincentive effect more than offset the income enhancements generated by the flow of public aid. As this happened, the poverty rate began to drift upward and the percentage share of all income received by those in the bottom quintile of the income distribution began what would turn out to be a long and steady decline. By the way, I don’t think that there’s a “correct” or “proper” level of income distribution. That should be a function of what people contribute to economic output. I’m concerned instead with boosting growth so everyone has a chance to rise. Which is why it is especially tragic that redistribution spending is trapping less-fortunate people in long-term government dependency by undermining their incentives to earn income. The bottom line is that it’s time to reduce – and ideally eliminate – the Washington welfare state. Though that involves a major challenge since the real beneficiaries of the current system are the “poverty pimps” in Washington. P.S. This Wizard-of-Id parody contains a lot of insight about labor supply and government-distorted incentives. As does this Chuck Asay cartoon and this Robert Gorrell cartoon. P.P.S. If you want to see sloppy and biased analysis (paid for with your tax dollars), take a look at efforts to rationalize that redistribution is good for growth from the International Monetary Fund and Organization for Economic Cooperation and Development. It should be fairly obvious that most of the relationships like taxation and relief distribution are not linear. You don’t get less poverty for the more money you spend and after a point tax revenue declines as the rate down. This should be evident in the fact that in spite of massive manipulations of both relief and welfare neither has been able to create massive increases of revenue or free us from poverty. Yet there is the constant drumbeat to increase taxes and welfare in spite of the obvious destruction that taxes and welfare have created. When you take into account that anyone and everyone employed by a government is essentially non productive labor / dependent on taxes for a living then the curve makes even more sense. The growth of dependency includes all military and politicians as well as the entire bungling Bureaucracy. Mooch, you are a reader and a thinker. You are highly intelligent and live, academically, above the level of mediocrity. The suggestion, in your final sentence, is not going to happen – at least not without Cruz winning the Presidency. And, even then, that doesn’t mean all his political brothers will vote in line with his goals to improve the system. And, if he doesn’t succeed, nobody will. The reason it won’t happen is because those in power, particularly the Democrats, want everyone to be dependent (the opposite of what you want). In their minds, the more people or businesses that are dependent on government, the more likely they will vote for candidates (during an election) who promise to continue to support them. Those who campaign on cutting spending and reducing taxes won’t get the votes because it is feared they will end dependency. The end goal of the politicians, particularly the Democrats, is to increase the number of people who are dependent by finding new ways to subsidize new groups of people. Subsidization (dependency) increases the voter base. Although, as in the case of Greece and so many others (California is heading there quickly), “. . . eventually, you run out of other people’s money.” – Margaret Thatcher. I hate to be the bearer of bad news but, the entire planet is headed for an economic collapse, based on Thatcher’s words. The only thing standing in the way is a false confidence in banks and money. But, once hyper-inflation goes through the roof (when governments print too much money), it’s over. At that point, prices on goods and services plummet because nobody has any money to buy anything – nobody has a job anymore. At least, until everything completely collapses, and then, everything starts over from scratch and people can find jobs for 25 cents an hour and buy a loaf of bread for 5 cents (after a complete deflationary period). The only way to prevent a collapse is debt forgiveness, but nobody is going to do that. China, for example, has no reason to forgive U.S. debt. They practically own America already. If the Chinese people were to run for election and take over all political reigns, and perhaps buy up all American law firms, it would be no time before America would be communist, just like China is, merely by changing all legislation. Mind you, the Muslims might beat the Chinese to the goal. There are many European cities, including in Britain, where the population of Muslims is already greater than 50 percent. If they all vote for only Muslim candidates, then it would be easy to put Sharia law in place and democracy disappears. And, all because politicians are doing everything they can to subsidize people and make them dependent, to increase their voter base. Independence, the goal you desire, is NOT an option with most of those who hold power. Please forgive me for being so blunt. P.S. The reason Ted Cruz is hated by the establishment is because he refuses offers of scratching each other’s back – where one politician (Pelosi) will agree to fund (subsidize) a pet project in another district if that politician (Clinton) will agree to fund a pet project in Pelosi’s district. The Republicans are also notorious for doing the same thing. And, they hate Cruz because he says no to pork barrel politics. That also means they may not cooperate with Cruz at all if he is elected President. If so, nothing will change, no matter how off-the-charts Cruz might actually be. First, I would like to thank you for doing the above analyses and showing that y ou care enough to do something about the fact that our govt. is throwing the economy down the drain. Secondly, I would like to offer, for your consideration, an illustration taken from my own experience, to show the complexity of the problem you have discussed. I also offer this with an apology;that I will take this opportunity to vent my frustration with both the state of affairs and those who try to remedy it. A few years back, my husband was convicted of a crime, sentenced, and imprisoned. He served his time, was released on parole, and re-entered the workforce. We had two small children at the time. He, by the grace of God, found a good job that paid $11 an hour and covered most of the bills. Money was very tight, so I went to work full time, and we appied for food stamps. We unfortunately ended up paying for me to work–the expenses were greater than the income, so I quit to become a stay-at-home mom. I was pregnant with our third. Between my husband’s job and the food stamps we were able to rent a cheap house and live very frugally from paycheck to paycheck.My husband lost the job over ethical disputes (he wasn’t willing to cheat customers to make more money), and we ended up moving in with his mom until he could find work. Having a criminal background and a lot of management experience is a death blow to job hunting. It took two years and the recommendation of a good friend to get him a low skill job making 8.50 an hour. We have 4 children now, my husband works two jobs, and we get $760 per month in food stamps and we still cannot afford to move out of my mother in law’s house. Now I have been asked, why don’t I work? My answer is that I possibly could, if I had someone to watch the kids, clean my house, do my laundry, chauffeur my children to and from school, cook my food, purchase a vehicle for me to drive to work–all at no additional cost to me. Some families I know who have both parents working have relatives who can help out. I help watch a neighbor’s children after school. I believe the problem is that our system is run by unrestrained short-sighted greed and impatience. There will always be those who abuse the system, they are not the problem. It is when hard working, decent folk cannot earn a living, then we have a problem. Americans are not independent people. We rely on either corporations or the government to feed us. A few of us can become entrepreneurs, but most have been trained to be cogs in the corporate machine. When one finds himself separated from the machine, he must either be left to rust in the government welfare box, or completely redefine himself–something that also requires outside help. Perhaps the goverment, schools, and charities should be more invested in teaching people how to live independently and thusly interdependently, rather than dependently. Why didn’t you just use one headline, instead of two. “Shocker: Subsidizing poverty leads to more poverty” is a far better title than “A Laffer-Curve Relationship between Welfare Spending and Poverty”. What were you thinking? Mind you, “Subsidizing poverty leads to more poverty” is someone else’s words. Redistribution: A fixed percentage factor, limited not only by the Laffer curve but also, ultimately, the 100% arithmetic quantity. Growth: Exponential, unlimited, quickly compounds to astronomical previously unimaginable levels. Voter: “A dollar of redistribution today is worth five perpetually compounding growth dollars in the future”. The analysis, as is the case with the Laffer curve, has no meaning without a time horizon. Even in the region where the Laffer curve is increasing additional taxes do indeed result in more revenue – in the short term. But soon the decreased growth they trigger (Rahn Curve) quickly cancel out the revenue increase. This is why Switzerland today actually collects more tax per capita than France. Because, as I said above, redistribution is a finite fixed factor while growth is exponential and unlimited. Those who understand the workings of reality through elementary arithmetic quickly realize that any exponent (however small) eventually wins over a fixed factor (however large). The voter-lemming hopes that the exponent will not catch up with the fixed factor until after he has lived his full life. That might have been true two hundred years ago, or even perhaps just fifty years ago. But it’s no longer the case. World growth trendline has now irreversibly accelerated to the point where the exponent of growth will catch up to the fixed redistribution factor very quickly -within the voter’s lifetime. The voter will get to sleep in the bad he’s making. This is more true today than in any other time in human history –and trends are accelerating even further. But the voter-lemming will not let go. He’ll drag his mentality down with him, until his country’s prosperity rankings sink into the middle income country group by mid century. Teach your children the traditional American values that enabled the American middle class to rise to the top of the worldwide prosperity scale. But give your offspring an international horizon because America’s top ranking will not last. Not with the stock of voters I see around me. You put all your eggs in the American basket, chances are, you’ll live to regret it. Rewarding dependency correlates with increasing dependency? Shocking. Correlation is not causation. Maybe you could look at the effects of white collar welfare on poverty. Or the effects of neoliberalism on poverty.